The exciting match between Timothy Bradley vs. Diego Gabriel Chaves Fight Replay online, video replay and Fight results of Bradley vs Chaves. UPDATE: Timothy Bradley Split Draw with Diego Gabriel. Tonight, the 31-year-old Bradley will now be out to prove that he's a world level operator, and he's taken on a dangerous challenge in the form of heavy handed Diego Gabriel Chaves. This match gives fans a much anticipated fight between two young fighters with a lot to prove. Chaves and Bradley have a combined three losses in their professional careers, and a defeat here would pretty much end any hope of a possible fight with Floyd Mayweather Jr. in the future. Bradley lost his rematch to Manny Pacquiao by unanimous decision, as well as his WBO Welterweight Championship. Many boxing experts felt as if Bradley's victory over Pacquiao in 2012 was a flawed decision. Bradley isn't a heavy knockout artist by any means, but he is a fast, young and athletic boxer who can outlast you with his endurance. Diego began his promising career with a perfect 22-0 record, 21 of which were fought in Argentina. However Chaves has lost two of his last three fights to Keith Thurman and Brandon Rios. Chaves was knocked out by Thurman in the 10th round and disqualified against Brandon Rios in August 2014. In his last fight in April, Bradley (31-1, 12 knockouts) was dethroned as WBO 147-pound beltholder in a unanimous decision loss to Manny Pacquiao, who avenged his split decision to Bradley in June 2012. The loss to Bradley, 31, ended Pacquiao’s near seven-year, 15-bout winning streak that included eight knockouts. Chaves (23-2, 19 KOs) is 1-2 in his past three fights and is coming off August’s ninth-round disqualification loss to Brandon Rios. Chaves, 28, had taken a streak of five consecutive knockout victories into his bout with Keith Thurman, who dropped Chaves twice during a 10th round knockout victory in July 2013. Tim Bradley’s resourcefulness is summed up in the many ways he wins. From brawler to boxer, from ugly to careful, Bradley is all of the above. Diego Chaves has no counter for that versatility. A one-dimensional Chaves is at his dangerous best in foul-filled exchanges that happen against unprepared opponents without a counter and the know-how to execute one. Bradley is none of those things. In fact, he has plenty of counters, which should be the difference in a one-sided decision. There is no way Bradley gets stopped by Chavez no way I think Chavez is a live underdog and has underated skills but Bradley was able to survive 24 RDS with PAC and was out on his feet against Provo and still managed to pull it together and win the championship rounds I'm not a big fan of Bradley he's not the most entertaining fighter except the Provo fight that was great but you have to respect his mental toughness he will never quit on himself. Timmy overlooked some little-known foreign-guy who proved to be a lot tougher than he or anyone else figured. Mainly the Provo fight. Still I can't picture DC knocking out Tim-Bo if Provo couldn't but it's quite possible that your guy could still out-fight him and take it. I'm not ruling it out. Bradley is obviously going to win and when he does, his next fight should be against Floyd Mayweather. That would be a fight with real potential. Bradley could give Floyd a real challenge if he's on his A game. He certainly gave Pacquiao trouble in both fights if you watched the punches clearly. 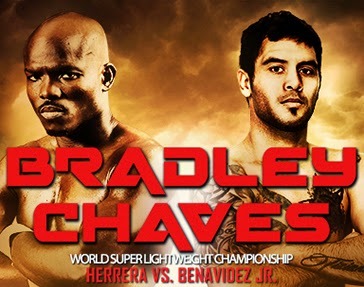 This is intended for Timothy Bradley vs Diego Gabriel Chaves live streaming, Bradley vs Gabriel live streaming, bradley vs chaves fight replay video, chavez vs bradley fight results, and more updates about Bradley vs Chavez round by round streaming online.